Looking for the perfect place to post important information where everyone can see it? Bulletin boards are ideal for posting high visibility notices. These noticeboards come in various designs to display important messages or information in classrooms, churches, and businesses. Options include enclosed/open face corkboards, wet/dry erase writing surfaces, indoor/outdoor and floor standing displays. 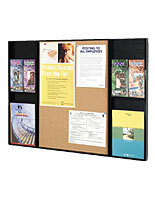 Bulletin boards have a reusable surface for posting memos, pictures, schedules, want-ads, and school projects. 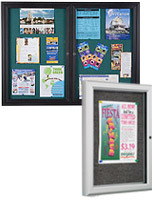 Our locking bulletin boards are excellent for keeping their contents secure from tampering and unauthorized access. Outdoor enclosed fixtures have a weather resistant seal for featuring important notices during inclement weather. How can our bulletin boards be used most effectively? Keep important notices visible in offices by placing these displays in break rooms and lobbies. This is an excellent way to feature schedules and other vital information where employees can see it. In schools, teachers can reward students by featuring outstanding school projects and awards. This will encourage pupils to work hard to get their work featured. Place our fixtures in community centers to keep everyone up to date with information. What better way to tell people about events than posting it where it can't be missed? When positioned in the front lobby or at the entrance, visitors will easily see upcoming events and notices. 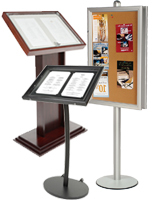 What types of notice displays are available? 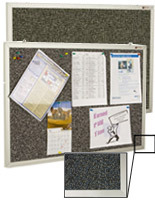 Our tack boards with a cork backing are excellent for featuring documents in a classic way. 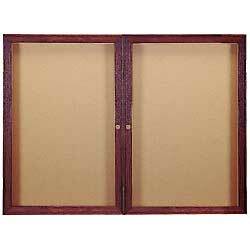 Our noticeboards are made using a natural self-healing material with a recognizable tan finish. Use these cork-backed models for a traditional notice posting area. We offer displays with fabric backing that feature modern shades like gray, blue and maroon. These are similar in functionality but come in more colors to match any office or community center. Rubber backed fixtures are another option, one that will last for many years of use. These typically feature darker tones and are available with a recycled fabrication for environmentally conscious organizations. 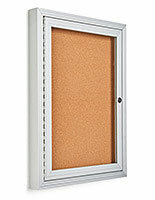 Browse our selection of enclosed message boards with secure locks to prevent tampering. This is a great way to ensure everyone sees your fliers while making sure that they are not disturbed. 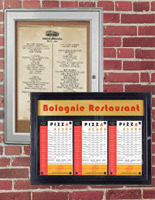 Also available are outdoor notice displays for featuring information. These enclosed units have a weatherproof seal that locks out moisture, keeping paper posts safe from the elements. Want to quickly add new info to your tackboard? 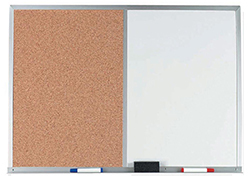 Try our combination units that feature a dry erase or chalk writing surface on one side and a pinboard on the other. Feature both official prints and written messages in one place! Our whiteboard cabinets open up to reveal both types of surfaces. How do these different models benefit users? Enclosed cork fixtures are great tools for delivering messages in public. These glass door displays have locking systems that can protect fliers and posters from every day wear and tear. The open face designs are also a great fit for indoor use, such as offices, places of worship, and school classrooms. 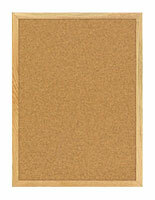 These enclosed corkboards come in different choices of backing colors to fit any environment. Combination boards with chalkboard and markerboard surfaces allow multiple display options for everyday use. Any user can also use them as an information center in your building or facility. Information centers like these make up an economical and efficient method of communicating. Shop 1000s of great commercial supplies on Displays2go.com for quick shipping and wholesale pricing!